What color makes you happy? What's your favorite color? Tell us what you think about color. After you take the Global Color Survey, you'll get the results from 130,000 from all over the world. New: The Color Matters Newsletter! Learning color has never been easier! Take it at your own pace. 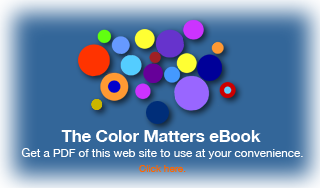 16 videos and dozens of downloadable resources from Jill Morton, the author of Color Matters. You'll learn the fundamental messages and meanings of colors - and much more - in The Psychology of Color Symbolism. Expand your knowledge of color, boost your creativity, and supercharge your enthusiasm! "Foolproof Color Formulas for Interior Design" will transform you into a master of dramatically constructed colors. You’ll be empowered to design one-of-a-kind interiors that reflect your creative abilities. 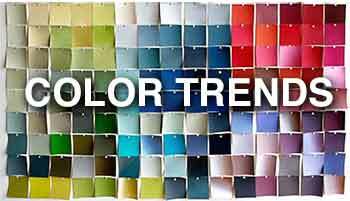 What is a color trend? Where do they come from? Does a color trend really matter in the 21st Century? Explore some answers! Check out the millenial pinks and unicorn color trends. Find out what Color Matters predicts as the hottest new colors for 2018. Is red the most extreme & powerful color on earth? How can yellow be the color of both happiness and caution today? Supposing the color blue was removed from the world, specifically the sea and sky ... what color would fill the void? Discover the unique meanings of colors.